During my school days I remember, me and my brother would rush to get home once we get out of our school bus. Our main focus will be to get into the pantry by the side of the kitchen. There will be an array of containers with so many homemade snacks that my Mom prepares or there will be fresh small bananas (called Njali Poovan Pazham...my favorite banana) in a basket those will be stored in dark area to ripe. As soon as we get home, we drop our bags in the designated area....oh yeah, we were very particular on that...I think that was something we got from our Dad (Air Force discipline); wash our hands and run straight to the pantry. By the time Mom comes with 2 glasses of chocolate flavored milk (Bournvita - an Indian Chocolate flavored Health mix just like Ovaltine) we will be snacking on the yummy treats. Being a stay home Mom, my Mom had enough time to make all kinds of snacks and she used to experiment a lot too :). So we hardly used to buy snacks, mostly all snacks were homemade and our pantry will be always full. Those were some good old memories to cherish. Now back to the new generation and their style. As soon as I pull my car into the garage after picking kids from school, they run just like we used to do. I will be screaming, 'Put your shoes on the shoe rack'; they run as if they didn't hear, I will repeat; then it works. Then I have to remind them to wash their hands; sometimes lil Noah is too fast that I cannot cope with him and he might have already bit a cookie :) without washing his hands. The bags will be dropped on the floor; which needs another reminder to put it away. To my question 'Did you wash your hand Noah? ', he simply runs to the bathroom as if he didn't hear anything and washes and comes back and sits like nothing happened :). Here the style is they leave the pantry door open and stare at the pantry for minutes, especially Noah, he cannot decide what to have. Sometimes it will not be in his reach; he pulls the chair and gets what he wants. My brother used to do the climbing when we were little. As kids we loved to hear the stories from my Dad; he used to climb up the attic to get the snacks when snacks were prepared and stored in airtight clay jars (called 'Bharani') in the attic for longer use. No matter which generation is it, the snack attack of kids are pretty much the same. I always encourage my kids to have healthy snacks like cucumbers, baby carrot, fruits or raisins and almonds and they like them too. But they also like to attack the pantry for cookies. So I try to make something whenever I can and store them so that they can have a homemade snack rather than store bought ones. 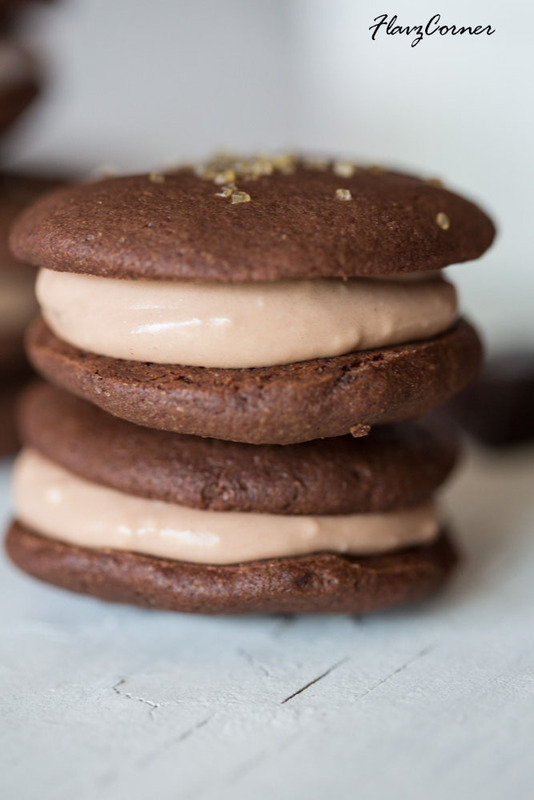 Since chocolate flavor is their favorite, I didn't have to think twice to make these cookies when I came across the recipe for Chocolate Espresso sandwich cookies. Sift together flour, cocoas, salt, and baking powder in a medium bowl. Beat butter, sugar and egg in a mixing bowl till creamy. Add espresso, Kahlua, and vanilla until combined. Add flour mixture and beat just until incorporated. Wrap dough with plastic and chill in the refrigerator overnight or 2 - 3 hrs. Divide the dough into 2 halves. On a floured surface roll the dough into a rectangular sheet and cut out 25 cookies using a cookie cutter and place them on the parchment paper lined cookie sheet. Sprinkle the Turbinado sugar and gently press them on to the cookies. Repeat the above process for the second half of the dough without the Turbinado sugar. Bake the cookies for 8 minutes or till they are slightly puffy and firm on the sides. Cool them on a wire rack and store in air tight container. Whip the cream cheese and whipping cream till soft. Add powdered sugar, kahlua and nutella to it and whip on high speed for another minute. 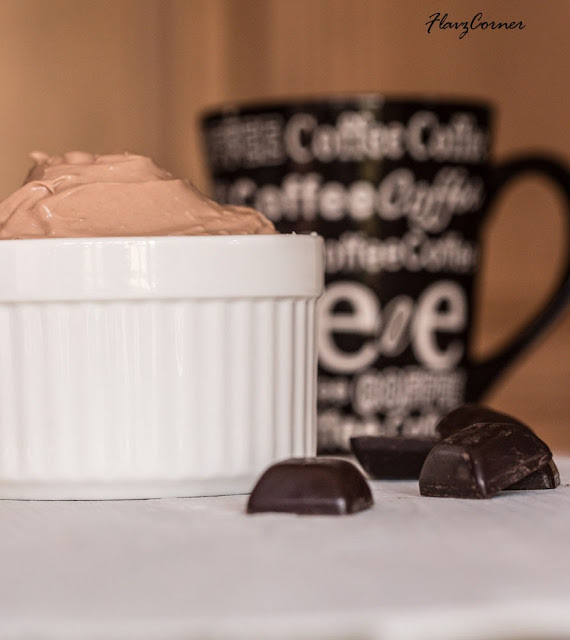 Adjust the whipping cream and powderd sugar for the desired consistency and sweetness. Store the filling in the refrigerator till ready to serve. Gently apply the filling on the bottom side of the chocolate cookie without Turbinado sugar. Top the filling with a cookie with Turbinado sugar and enjoy. I used 8 oz cream cheese as it was easy for me to use the stand mixer to make the filling with the sauce and the amount of other ingredients for making the filling was adjusted for the cream cheese. If you are not baking the cookies all in one batch, keep the second half of the dough refrigerated till ready to roll and bake. Otherwise the dough will be hard to work with. ooh !! Shibi..had this smile on my face reading thru this..infact, anything abt childhood brings a smile to our face, yeah !!! we all can assocaite so much with each other ! in past and in present !!! honestly. loved the cookies..very very tempting, n lovely presentation as well. My mom always has stuff made for after school snacks too! Always a highlight of the day. ;-) These look wonderful - thanks. 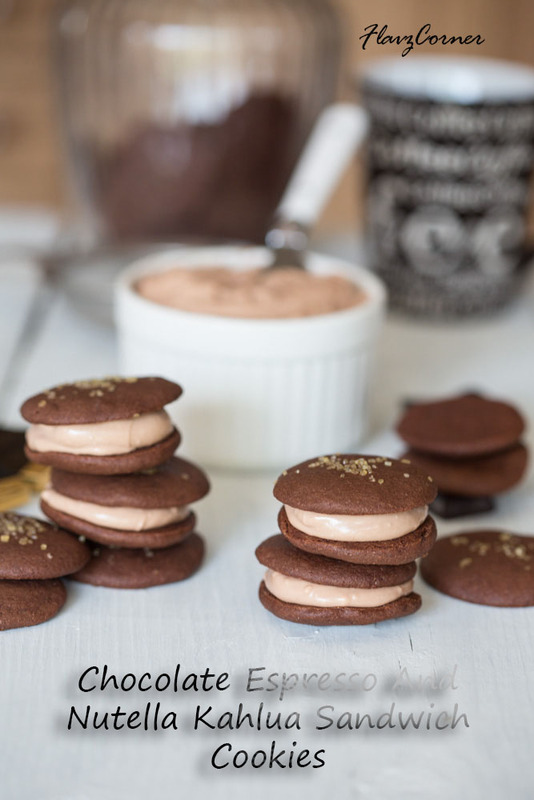 These look awesome - I could just lap up that kahlua filling! yum! Mmmm... tempting cookies with delicious flavors!! I just had nutetlla on toast with a cup of coffee. I definitely prefer eating these cookies for breakfast which has both in it already. :D Beautiful shots Shibi! An awesome ice cream cookies. Shibi the flavors are all quite interesting. Very good pictures. That filling looks so delicious and creamy. Yummy combination!